First Universal Driving Game Kit Ever! This is sprint racing gone BAD! It's all-out war on the track as playes blast away at the drones (and each other) to finish first! Players shoot playfield targets for extra points and bonus missiles! One or two payers can race at any time with Badlands buy-in and game continuation features. If a player loses to one of the drone cars, he can put in another coin to continue on to the next heat and retain any custom car options he has acquired. 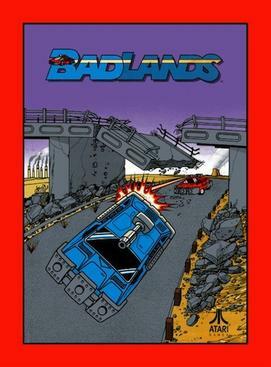 Badlands has eight unique track layouts set in eight different animated backgrounds that react to player shots and crashes. 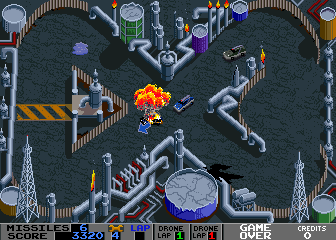 These tracks change as the level of difficulty increases.